Purchased the vehicle new from a local Chrysler dealer,on 12/27/2005, maintained it meticulously,& garage parked. At 76,000miles I had the vehicle inspected for vibration and was told engine is shifting due to rotted cradle that was a common problem with the 2004-2005-2006 Chrysler Pacificas. Estimated cost is $4000 to replace. The repair cost may exceed the market value, the only other option is ' the junk yard ' at 76000 miles! 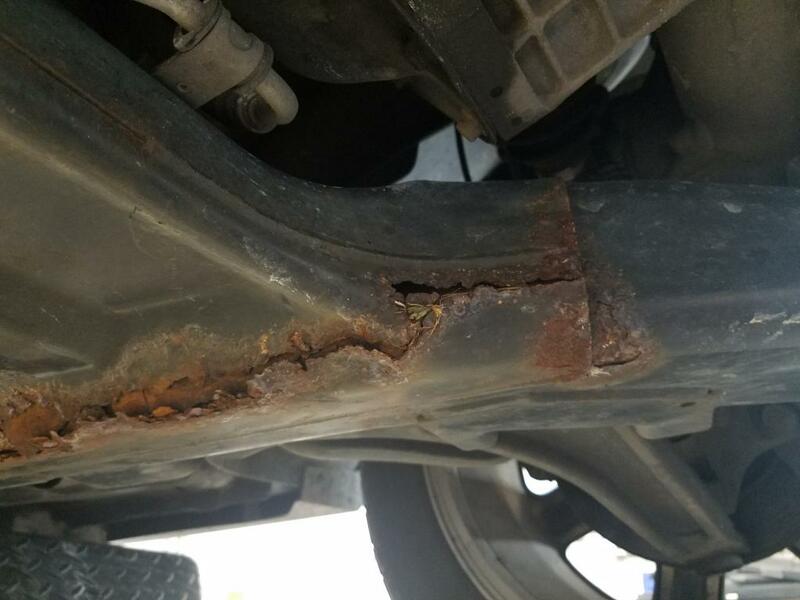 This is a manufacturers design fault that has been known by Chrysler for a decade, yet we were never notified by Chrysler or the dealer that there was a serious and dangerous potential disaster possible. 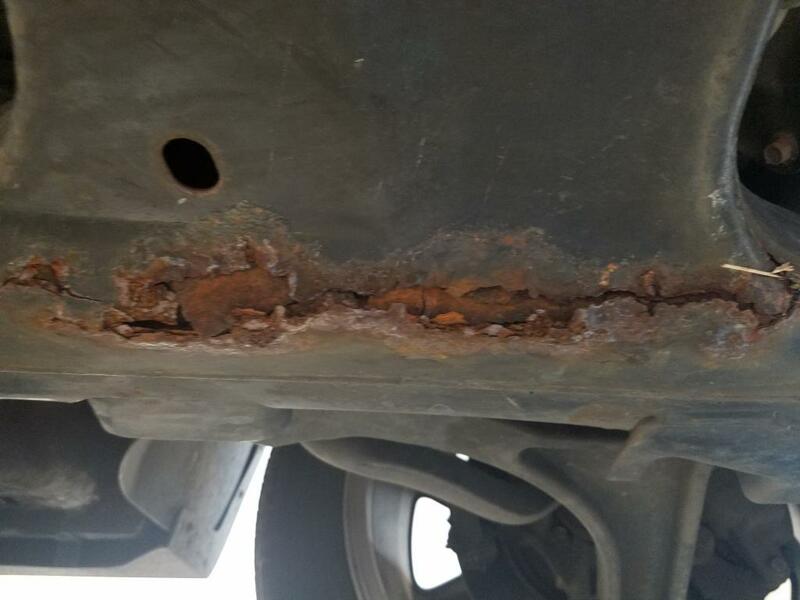 Our mechanic has been in contact with Chrysler Corporation service and the response is NO HELP, not even providing parts and owner-paid labor! There is a class action law suit against Chrysler Corporation over the known cradle design fault and Chryslers denied warranty repairs and we wish to be included as a party. I have a 1999 Chevy Blazer and the engine frame is solid. However, on my 2006 Chrysler Pacifica, the engine frame is rotting out at an alarming rate. Obviously, Chrysler cut corners in preventing this problem from occurring. I recently sold the Chevy I had before I was made aware of this issue with my Pacifica. I can not purchase another vehicle at this time. I will be driving with my fingers crossed hoping I do not kill myself or anyone else. The engine cradle crossmember is rusted through underneath on the passenger side. The car feels like the whole bottom is going to fall out. My tie rod broke yesterday, I was told by my mechanic that the Sub-frame (Engine Cradle) is rusted and needs repair. I researched this and found out it will cost upwards of $4000. I called the FCA (Chrysler) gave them my info, including the VIN #. I was told that my car was not on the list for a re-call, and the repair would be an out of pocket expense "REALLY"
I know there was a Class Action Lawsuit filed in Ohio back in 2015, how can I find out if there has been one filed in Michigan or how do I go about filing one in Michigan. I am the original owner. Recently I had an tailpipe exaust problem. I took my car to Redline Auto Service. They informed me of the engine cradle rotting problem due to rust. They showed me the damage which was on the passenger side of the vehicle. They said the AC drip hose was to short and dripped on the engine craddle causing the rust. They would not address the exhaust problem because of the damage to the engine cradle and advised me to contact Chrysler. I contacted Chrysler Customer Assistance at 800 247 9753. 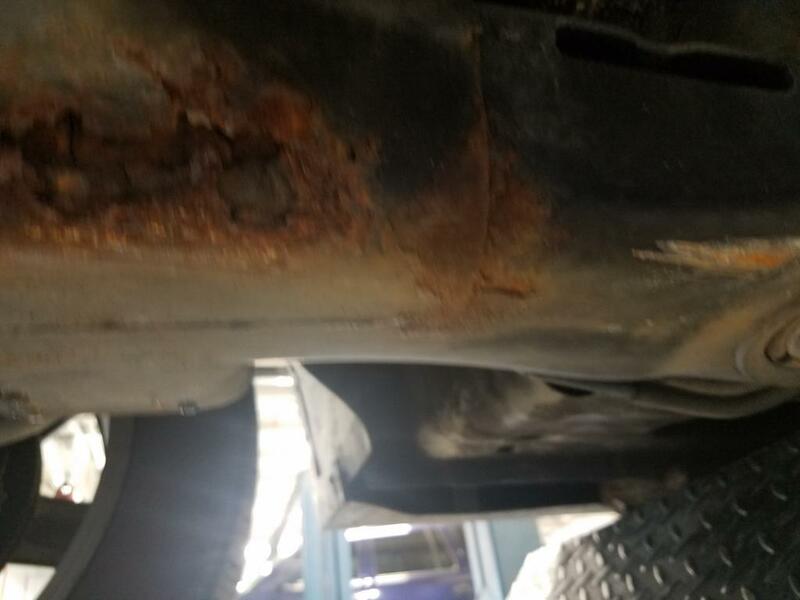 I was advised to take the vehicle to Roseville Chrysler in Roseville, MI for an inspection. I made an appointment for November 21, 2017 at 9 am. The service advisor was Bryan Collins. I paid 57.00 for the inspection which only took a half an hour. Mr Collins explained to me that the drip hose was leaking on to the engine craddle causing the rust. He said there was no damage to the left side (drivers side) of the engine cradle. He said he would advise Chrysler Customer Assistance. I called the dealership the next day and they informed me that I needed a case number. I called Chrysler Customer Care and they issued me case # 32879012. I called the dealership and gave them the case number. I also texted Bryan Collins the case number. On Friday November 24, 2017 I received a text message from Mr Collins stating that "I may receive an email survey from Chrysler completing it means the world to me it's my report card". I text back will do and asked for an update. I did not receive a response. On Monday November 27, 2017 I called Mr Collins he was not available so I left a message for him to return my call. An hour and a half later I called again and got a voice mail. No reply. I called Chrysler Custome Assistance and the representative put me on hold while she contacted the dealership. She came back and told me they did not have any information. After a brief conversation she explained that she called a dealership that did not do the inspection. I gave her the correct information and I was put on hold again. When she came back to me she said that there was no recall. I asked who she spoke to and it was not Mr Collins. She put me on hold and called the dealership and spoke with Mr Collins. She explained to me that Mr Collins told her that the drip hose caused the damage to the engine cradle. She said there was no recall and the vehicle was out of warranty and there was no extended warrenty, so I would have to repair the vehicle. I told her that this was not a warranty issue that it was an design engineering error and that the hose should have been long enough to route it so it did not drip on the engine cradle. She said that she was going to refer the matter to management and they would get back to me in 24 - 48 hours. This is the newest vehicle that I own. I bought this vehicle brand new. I always buy new vehicles and keep them for years. Other then the constant mechanical problems that I have had with this car since I bought it I never felt that it was a lemon. I will NEVER own another Chrysler product as long as I live. The final straw was a dealer offering my $1000 on a trade in.... Then I found the corroded engine cradle... OMG I HAVE NEVER SEEN SUCH A CHEAPLY MADE PIECE OF GARBAGE. 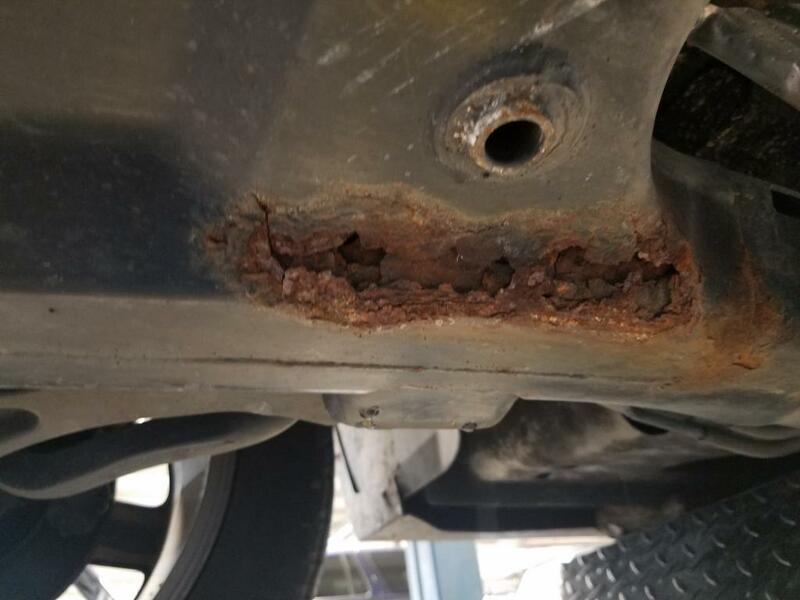 I used to live on the beach in a salt infested environment and I have never seen a car's frame rust like this. This car was never in that kind of environment. Then the dealer's service manger tells me that yes he thinks that the engine cradle was manufactured improperly but he can't and won't do anything about it. 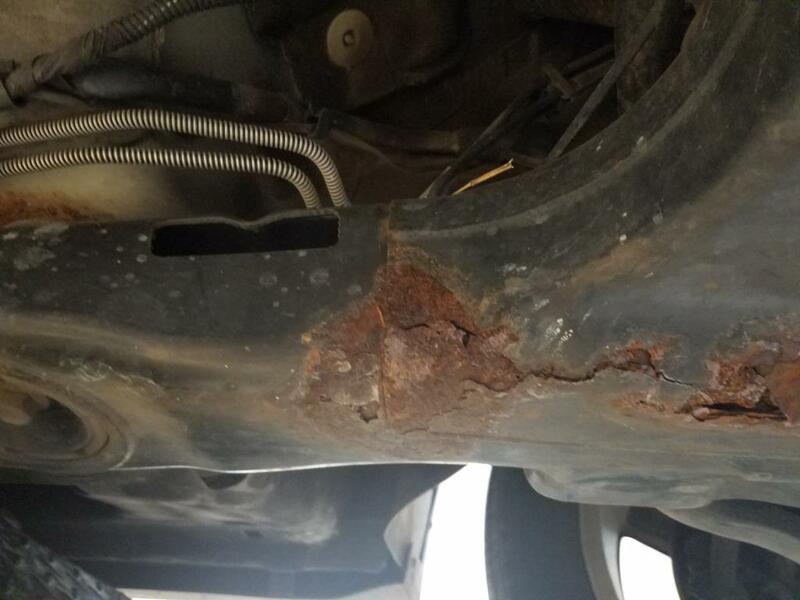 Even Chrysler won't support it's products defects...The tell me, "well the car is so old"
Cracked motor mounts and rusted engine cradle, Chrysler is aware of the problem. My car failed inspection because my mechanic noticed it the engine cradle was rotting and had holes in it all over. So he said this is an ongoing problem with Chrysler Pacifica's and that they were poorly designed. To repair would cost me about $2000-2500. I feel horrible and lied to because Chrysler isn't taking responsibility for this defect. That kind of money is not in my budget. I don't understand how something so important could be overlooked by Chrysler.....I'm really fed up. Brought my 2006 Pacifica in for routine oil change and tire rotation. Was shown the rusted engine cradle that fingers could be poked through. Called Chrysler and the dealership and was told the repair would not be covered to the tune of $2500-$2900 dollars since my car did not fall in the specified couple of months of manufacturing that was covered due to a faulty part. I was also told it would take 2 weeks for the part to come in. Why would it take so long? Based on my research Chrysler knows this part is faulty but is unwilling to do anything about it. There have been lawsuits about this manufacturing problem. I will never again buy a Dodge or Chrysler vehicle. Own up to the problem and fix it! After reading that this is a common issue on the vehicle, it is very disheartening. The costs for such a repair are more than the car is worth - it has caused me to not only have to purchase a new car, but I am still paying for the broken car and have no means to get it repaired at this time. I've always liked the Pacifica, and up until this, I was considering purchasing a newer model once I was done with the payments - but it seems that the company is well aware of the issues regarding this model and have no intentions of correcting it. Chrysler has lost a customer!! !